No, America, we cannot wait another 4 years if we are to save the America that we love. America has been blessed by the hands of God over 245 years ago, and today, we are on the cusp of keeping her that Beautiful “Shining City on the Hill”, or just another sleazy third world country trying to survive in a world of corruption. The has been no generation in American History that has allowed the existing government to get by with so much division, controversy, criminal activity, and rupturing of the Constitution. Are we the generation of cowards, or are we going to take our country back in 2016 by electing once again a man who puts country before self, liberty before gain, and follows the Forefathers map of the Constitution as his northern star? We look to the right, corrupt, incoherent sell their soul for a lifetime appointment to Congress, and then we look to the left and see division, criminal activity, PC enforcement to the level that corrupts the inner fabric of America. We see politicians negotiating away our inherent Constitutional Rights, and spending our children’s future today. Why, for the quick fix of a television appearance, or a cheerleader party back home due to pork inflated bills. Few, while hard to find, politicians today have it in their gut, that special desire to bring America back to the Constitutional Country that has made it the beacon for the world for over 240 years. America will never give up its sovereignty to any other power, including the UN, and will never bow to a King or other leader in any country. America will never apologize for protecting innocent lives around the world, and shall never use the excuse that it is not her fight. We have seen what weakness at home does. We see history repeat itself from Jimmy Carter to current day Barack Obama. No, America is not ready for anymore crooked, lying self-indulging arrogant politicians either on the right or left. 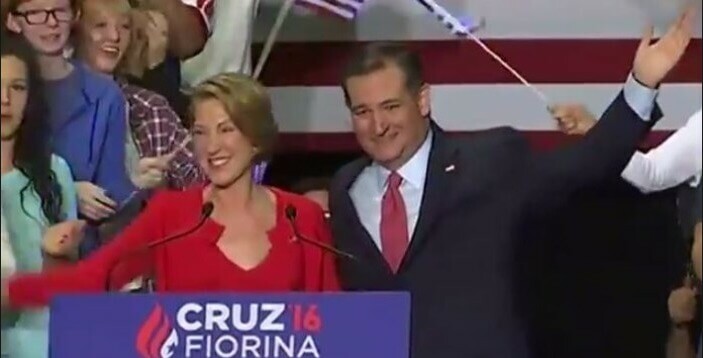 With all that said, we have one politician with the gravitas, the background, the measured idealism to bring the constitution back to America, and that person is Ted Cruz, a great Senator from the state of Texas, and his sidekick, vice presidential choice of Carly Fiorina, a hard-hitting well educated, strong conservative. What do we do? We allow an arrogant party changing chameleon to belittle, lie about, and create hate against Ted for his own gain. No America cannot afford Donald J. Trump. Ted creates fear in liberals and socialists cannot stand him. Republicans demonize him, while democrats mock him. The media ignores him, while the #neotrumpets misquote him. Lobbyist hates him, while the pundits underestimate him. Now to me, that is an underdog, and a true hero to stand side by side with to fight for our Constitutional rights. And most of all, America needs him! Ted has spent his life fighting special interests, corruption, and attacks on our Constitutional rights. Ted stands for Liberty and Freedom and is what America needs today. We need a principled man of character, and a history of fighting for the American, and not for himself, or for the rich, and well connected. Ted fights every day for you, me, our children, and will never accept the negotiating of our Constitutional freedoms away. Now many of the #Neotrumpism followers will say he did not get enough votes to keep him going, but the truth is in the delegates and the convention in Cleveland in a month. We as Americans can sit here, wait to see what our state’s delegates will do, or we will contact our State delegates and demand that they understand that they MUST vote his or her conscious, and not be bullied by the state parties, or allow the national GOP to lie to them that they must vote for Donald Trump. There is a time when all men and women must stand strong, come out of their safe space, and stand up for their country, their future, and what is best not only for themselves but also for what is best for all Americans. The Constitution makes it plain, that we are in control of our life, liberty, and the pursuit of happiness. The government cannot tell us what we do with our lives. The Constitution gives us the right to pray to our God, speak our mind, and report the truth about corruption. This same Constitution provides every home the ability to protect themselves by allowing us a gun. We no longer can allow bought and paid for politicians, liars, criminals, racist, and bigots to create a more hateful, less happy country because they want another notch on the belt of accomplishments, or to find another pathway to steal money from Americans, and take bribes from murderers, minority haters, women abusers and so on. We cannot afford to elect Hillary Clinton, who had the ability to save lives in Benghazi, but she ignored the phone call. We cannot afford to elect Donald Trump because we cannot afford racist and bigots to run ramped in America, and divisions in race, ethnic background, religious background and financial successes. No, we cannot afford to offer up America by ignoring our Constitution, and the only team who can fight to make a country successful for every individual, every dream, and every child. We need to free ourselves from the chains of non-participation and make sure every delegate is ready to fight for the Constitution at the Convention this year. We need to elect a true Constitutional Conservative that knows the American struggle, and will battle for you and me every day they are in office. Your choice, sell out for your self-gratification for today or fight to keep the Constitution in place and elect a true Constitutionalist. Tell your state delegates to free themselves, and reject Donald Trump at the convention!!! !